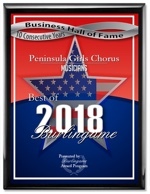 For the tenth consecutive year in 2018, Peninsula Girls Chorus has been selected for the Best of Burlingame Award in the Musicians category by the U.S. Commerce Association. PGC is in the Burlingame Business Hall of Fame. Each year, the Burlingame Award Program identifies companies that they believe have achieved exceptional marketing success in their local community. These are local companies that enhance the positive image of small business through service to their customers and our community. These exceptional companies help make the Burlingame area a great place to live, work and play. Various sources of information were gathered and analyzed to choose the winners in each category. The 2018 Burlingame Award Program focuses on quality, not quantity. Winners are determined based on the information gathered both internally by the Burlingame Award Program and data provided by third parties. 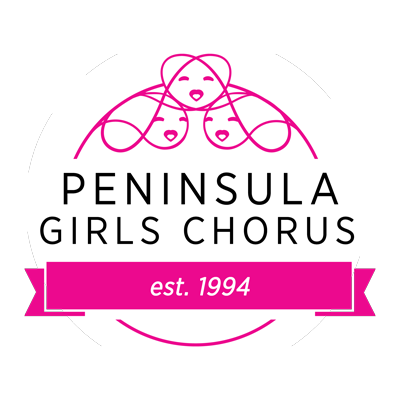 The Peninsula Girls Chorus was named the 2008 recipient of the ASCAP/Chorus America Award for Adventurous Programming of Contemporary Music. Given to only one children’s or youth chorus in North America each year, the award recognizes a chorus for programming significant recently composed music that expands the mission of the chorus and challenges the chorus's audience in a new way. The award was presented at the Chorus America National Conference, held in conjunction with the National Performing Arts Convention, in Denver, Colorado. The Peninsula Girls Chorus’ Founder & Artistic Director, received the award and $1000 at the Chorus America conference on June 12, 2008. The Peninsula Girls Chorus received this award for its 2006 – 2007 season; one of the unique programming features of the Peninsula Girls Chorus is to give its members and their audiences the chance to become familiar with a composer’s work by performing multiple pieces, including commissioned, premiered and older works sung at different concerts during the season. This ASCAP/Chorus America award acknowledges the commitment of the Peninsula Girls Chorus’ dedicated singers, hard-working Board, and loyal community."